While visiting McTunny's Sweet Emporium in the Custard Factory, Birmingham UK I noticed that they had a range of crisps that I hadn't sampled yet. As I keep forgetting to write up all the little bits of chocolate I pick up this seemed a good excuse for more lunch time snack reviews. 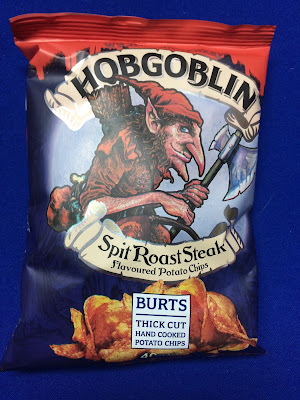 First up I tried the Hobgoblin Spit Roast Steak Crisps. 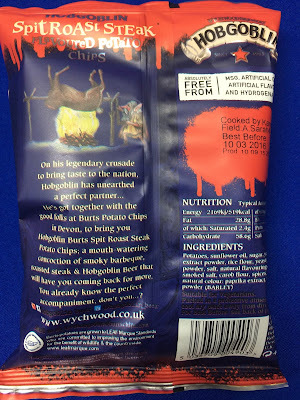 These look like perfect Pub Crisps being not only an interesting talking point, but linked to real ale. I'm not sure about the spit roast part - does that mean it tastes of out door cooking? The back of the pack confirms it - smokey BBQ and Hobgoblin Beer. Some of the tasters in the games shop I ate them in remarked on the similarity to Burts Guinness crisps, but it's likely that the same crisps are used with different flavours added. All beers taste very similar to me, but I think side by side I'd be able to tell a stout from an ale! In isolation though these could be any meaty beery crisp. As they are Burts they are decent quality, and people having one out the bag felt like they'd had too much as they are a lovely big size. Very manly, very good for sharing. They are crisp and fresh as you'd expect, and the flavour while not massively distinct is meaty enough that veggies best stay away, and interesting enough that it doesn't feel like a typical supermarket lunch time crisp. If you own a pub, or just like being in them then I can recommend these, they will go down well. I could happily justify Kettle Chips size sharing bags of these for gatherings and not have to worry about wondering what to do with the last few. Aldi currently have these in stock.